April 12, 2013 - Internet entrepreneur, Robert Österlund, founder of Inbox.com, raised over $17,600, before fees, dedicated to Sandy Hook Elementary students following the tragic events of December 14, 2012 in Newtown, Conn. Using the popular fundraising site IndieGoGo, Österlund quickly surpassed goals due to the viral nature of the campaign and promotions on one of the top sites on the Internet, Inbox.com. “IndieGoGo allowed us to easily point our Inbox.com campaigns and proved to be an efficient means of fundraising for the children,” stated Mr. Österlund. "All monies collected through the CT PTSA Sandy Hook Fund will be used by the Sandy Hook Elementary School PTA to enhance the lives and learning of students through classroom and community based programs, resources, and enrichment. Our purpose as a PTA, now more than ever, is to make every child’s potential a reality by engaging and empowering families and communities to advocate for all children. Thank you, Mr. Österlund, for these efforts and for your support in helping us make that happen." 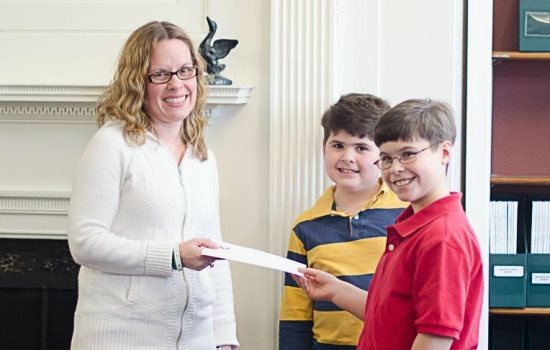 Tracey Jaeger, President, Newtown PTA, accepts check on behalf of the children and Sandy Hook Elementary’s PTA. Mr. Robert Österlund is a lifelong entrepreneur and has founded a variety of successful business endeavors in the tech world as well as in global commercial real estate. Mr. Österlund recently moved to Toronto, Canada. Mr. Österlund has constantly involved his companies, assets and his family in charitable works such as disaster relief for Hurricane Katrina, the Indonesian Tsunami, the relief effort in Haiti following the earthquake, and many other ongoing charities involving canine cancer and children’s programs in Scandinavia, the Bahamas and North America. Inbox.com, Inc. is a leading innovator of search technology and software applications focusing on rich, interactive experiences and safety for consumers and businesses. Inbox.com products are meticulously developed and are highly ranked by industry experts and users alike. The company is dedicated to the idea that everyone worldwide should have access to free software. Inbox.com alone is listed as the 63rd most trafficked site by unique visitors in the world according to Compete.com by its November 2012 report. To learn more, visit www.Inbox.com. Indiegogo empowers people around the world to fund what matters to them. As the largest global crowd-funding platform, campaigns have launched from every country around the world with millions of dollars being distributed every week due to contributions made by the Indiegogo community. At its core, Indiegogo is the equal opportunity platform dedicated to democratizing the way people raise funds for any project—creative, entrepreneurial or cause-related. The company was launched in 2008 and is headquartered in San Francisco, with offices in Los Angeles and New York. For more information, visit www.indiegogo.com and follow us at www.facebook.com/indiegogo. Note to editors: Inbox.com is a trademark of Inbox.com, Inc. IndieGoGo is a registered trademark of IndieGoGo, Inc. Other company or product names mentioned herein are trademarks or registered trademarks of their respective companies.